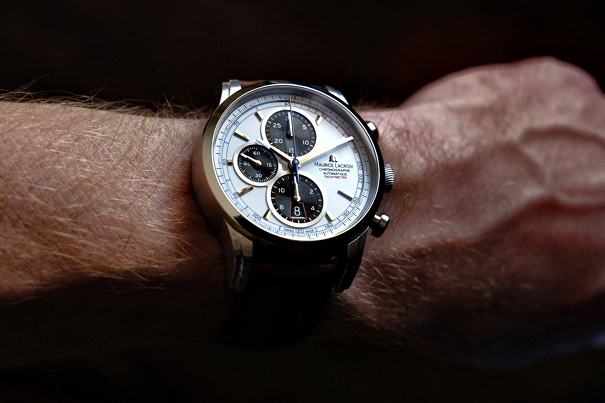 I sat at a bar in Las Vegas with Sandro Reginelli, lead designer of Maurice Lacroix. We had just had the watch conversation to end all watch conversations, and decided to celebrate it over a glass of scotch. As is the case with every modern meeting about watches, we immediately started going through watch pics on our phones of timepieces we either owned or admired. One image that he showed stayed with me, and to this day I haven’t been able to source it. The watch was of a very early Panerai that was probably one of the companies’ first. What struck me about the image wasn’t the design or the complication, it was the weathered look that it existed in. The watch was obviously worn quite a bit and was in no way the “safe queen” that many expensive timepieces live their lives as. It’s leather strap barely held the body of the watch any more, it’s case was so worn that the brushing marks on it had begun to resemble a modern day matte finish. It was a beautiful watch for what it was and what it meant. It was the past that still lived in the current. For those that know my affinity of watches, you most likely know my love of modern watches that respect the designs of their predecessors. 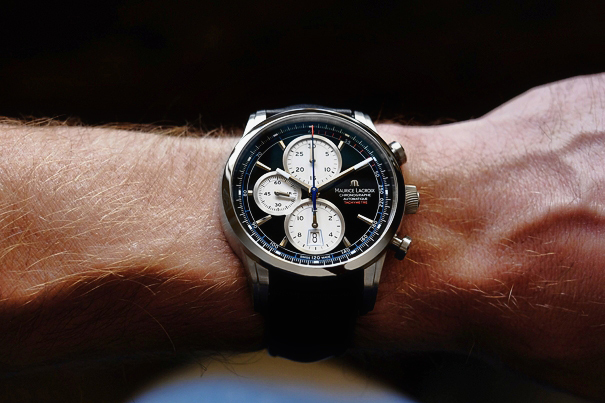 From the remake of the McQueen Monaco to the Sapphire Sandwich Speedmaster, I crave living in the past with the protection of the modern. Being able to wear a modern retro-styled watch is the embodiment of Ferris Bueller taking out the Ferrari and not worrying about chucking it through the window. While I don’t condone abuse of a watch, I do support wearing one with confidence and not worry. If you are going to invest in a cool watch, why only wear it to nice dinner? Being very fortunate to have a relationship with Maurice Lacroix, I had the luxury of getting both versions of the watch sent to me to spend some time with. I can say that if there were ever watches that would get “lost” on their way back to ML, these are them. From the first outing with the Chrono Retro, I got comments from friends and strangers alike (especially on the white dial model). They are very catchy pieces and had me smitten. I guess that is the appeal of their retro styling to me. 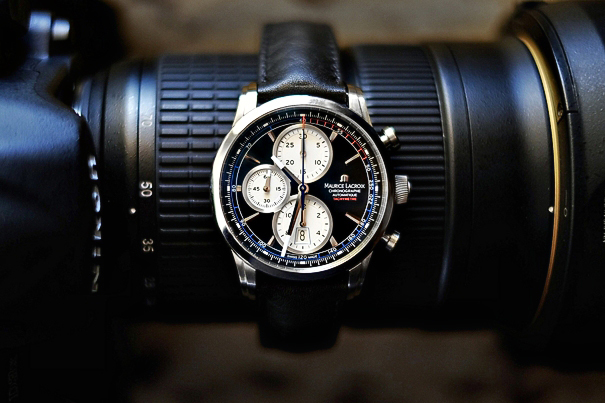 It takes me back to a time when I first discovered my passion for watches. Just the act of keeping time felt like an historic event was happening on my wrist. Wearing a watch was a document of the history it kept on its dial, and you function as both participant and observer. The interaction of the textures became a study of light itself, and watching the second hand could silence even the busiest of worlds around. Wearing a watch that inspires quiet confidence is a journey into self realization where pride and humility coexist. Very nice write up Blair. 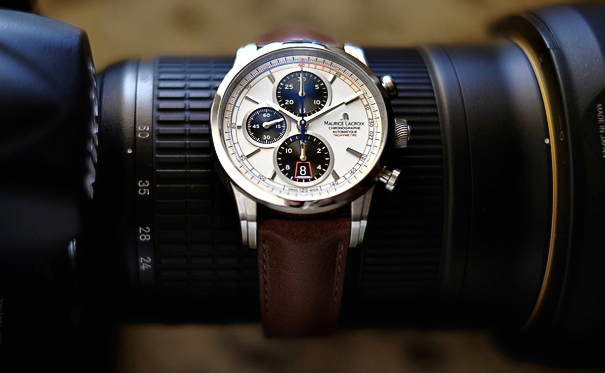 They certainly are beautiful watches and I agree the white faced model is the most striking. Hope all is well in AZ. We will have to setup a weekend when the wives, yourself, and I can all meet in Vegas.